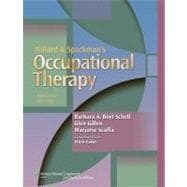 by Schell, Barbara A. Boyt; Scaffa, Marjorie; Gillen, Glen; Cohn, Ellen S.
Willard and Spackman's Occupational Therapy, Twelfth Edition, continues in the tradition of excellent coverage of critical concepts and practices that have long made this text the leading resource for Occupational Therapy students. Students using this text will learn how to apply client-centered, occupational, evidence based approach across the full spectrum of practice settings. Peppered with first-person narratives, which offer a unique perspective on the lives of those living with disease, this new edition has been fully updated with a visually enticing full color design, and even more photos and illustrations. Vital pedagogical features, including case studies, Practice Dilemmas, and Provocative questions, help position students in the real world of occupational therapy practice to help prepare them to react appropriately. This market leading text provides the most comprehensive and current presentation of occupational therapy concepts and practice. The 12th edition of this classic text invites students with a fresh, four-color design and new photos and illustrations, as well as the fully updated text.